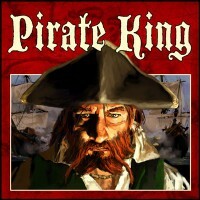 Pirate King is a new twist on classic game play. 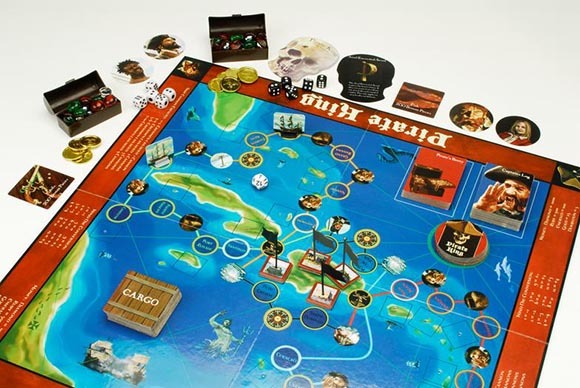 Seamlessly blending classic board game genres into one exciting adventure, players, or in this case Captains, sail around the Caribbean capturing territories and building fortifications while picking up crewmen and cannons for their ships as well as great mysterious treasures that aid in combat, movement, economics and even curses! This is a game of economic management, property building, and naval combat. Victory can be achieved through force of arms, economics or a combination of the two. Why pay when you can fight? That’s the pirate way. But only the wise captain knows when the price of fighting is too high. It all depends on what kind of Captain you want to be on your way in becoming the Pirate King. There are also 3 post release rules sets that are all together in the free download "All Hands On Deck" which includes the "Cuthroat Rules" & "Crewmen Charcters Expansion"
Add a Review for "Pirate King"
1 Pirate King Graphic Story"